Age restrictions: Children under 16 must be accompanied by an adult whilst in the vicinity of the tour. Pick up point: Victoria Coach Station. Please exchange your ticket at the redemption point. Please check in at least 20 minutes prior to departure and hand your voucher to the Premium Tours representative on board the bus. Important info: Victoria Coach Station. Please exchange your ticket at the redemption point. Please check in at least 20 minutes prior to departure and hand your voucher to the Premium Tours representative on board the bus.Return transportation to Warner Bros. Studio Tour London on a Double Decker branded bus.Entrance ticket to Warner Bros. Studio Tour London.This tour is self-guided and will not include the guided tour.Once confirmed all bookings are 100% non-refundable and non-exchangeable. If you have ever wanted to ride a broomstick or explore the shops of Diagon alley then the Warner Bros Studio Tour is the experience you have been waiting for. With a huge number of interactive activities and props from the films visitors can board the Knight bus, wander through Privet Drive or enjoy a refreshing butterbeer. With thousands of original props and costumes as well as animatronic creatures and original sets the tour also offers digital guides that will enhance your visit with an explanation and insight into the film making process, this is one adventure all Harry Potter fans should partake in. Booking through Hotel Direct guests will not only get the best possible price for their accommodation but will be transported by coach from central London to Leavesden Studios which is located near the M25. For more than a decade the Harry Potter franchise called Leavesden Studios its home, when production wrapped after the Deathly Hallows Part 2 in 2010, the production crew decided that it was a waste to dispose of the vast wealth of props and costumes involved. They decided that instead of just destroying these iconic items they would allow Harry Potters legions of fans to gain an understanding of the work that went into producing this hugely successful franchise. 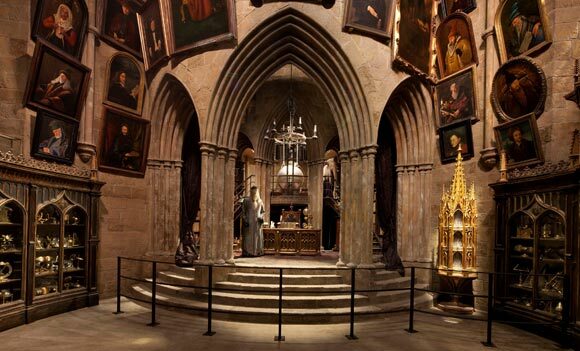 Including many interactive events such as green screen broom riding making this more than just a tour, allowing visitors to feel like they have been transported into the magical world unknown to most muggles. Many of the books in Dumbledore's study were phone books that had been covered to look like ancient tomes. The portraits that adorn the walls of Hogwarts are of the film crew and were all hand painted.